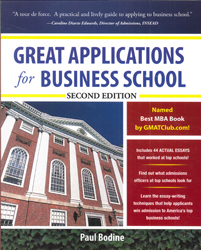 Great Applications For Business School Second Edition - ubiq bookshop: the best place to buy books! The bestseller that helps students gain admission to elite professional schools Helps students create essays that are attention-grabbing, express individuality, identify goals, and play up strengths and talents to distinguish applicants from the rest of the competition. The eight most common admissions essay topics--and how to answer them. 22 actual essays by successful applicants to top schools. New material on the specific problems and strategies for the most common applicant types and on wait-list letters. Featured in the January 2010 Business> newsletter.